Without natural resources we couldn’t survive. Conservation education is vital to ensuring people of all ages understand and appreciate why natural resources like trees, water and animals are important and how to conserve them for future generations. Texas A&M Forest Service strives to educate and inform all Texans on the benefits and conservation of our resources. Project Learning Tree is an award-winning environmental education program designed for teachers and other educators. PLT uses the forest as a window into the world, engaging the next generation of America's leaders and decision makers. Find resources and professional development on the Texas PLT website. Tree Trails is a project for students, by students, to celebrate trees. Enhance outdoor classrooms at schools, nature centers and public parks by creating an education trail focused on trees. Access lesson modules and the mapping program on the Tree Trails section. As an educator, you can introduce a whole new generation of children to Smokey Bear and his message of Wildfire Prevention. Check out a variety of materials to easily integrate into your curriculum on Smokey Bear’s website. Texas Project Learning Tree offers workshops for all grade level educators throughout Texas. Check our calendar or offer to host one at your facility. Teacher Conservation Institute is a week-long workshop held in East Texas which uses the forest to teach environmental education. The Trees of Texas website hosts a wealth of information from tree biology, a tree dictionary to a way to explore Texas Ecoregions. Envirothon is an intense high school team competition set up to enhance students’ environmental literacy and enable them to make informed decisions regarding the environment. Tour the Texas Forestry Museum in Lufkin or participate in grade-level programs correlated to TEKS. They offer traveling trunks that are available for checkout, as well as an extensive video library. The Natural Inquirer is a middle school science education journal created so that scientists can share their research with middle school students. Each article tells about scientific research conducted by scientists in the USDA Forest Service. It is available in both English and Spanish. The goal of Texas Nature Challenge is to get families and kids outdoors by visiting as many participating parks and nature areas in Texas as they can. At each site, participants complete activity challenges designed for family fun and nature exploration. Travel across Texas or find nature challenges in your area. Nature helps make kids healthier happier, and smarter. Nature Rocks Texas helps you find nature-based places, activities and events in your area. Texas Children in Nature is a grassroots network working to connect children and families with nature in Texas. Visit the Discover the Forest website to get ideas of where to go and what to do in your forest. The colorful Trees of Texas poster walks you through how to identify the state tree of Texas—the pecan tree. To request the Tree Of Texas poster, email education@tfs.tamu.edu. 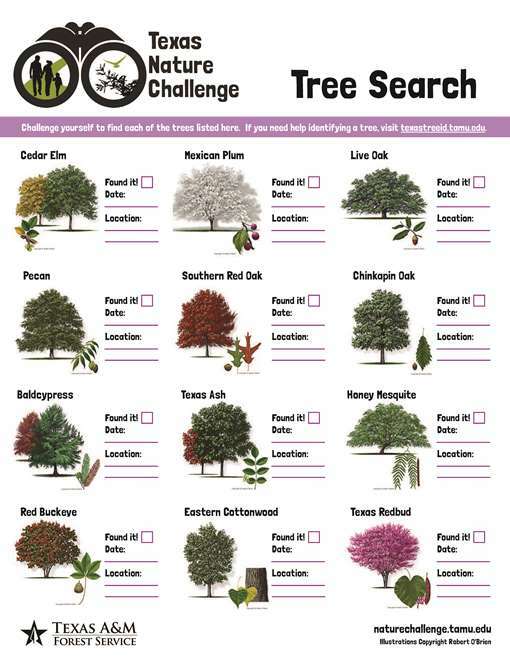 For more information on tree identification, visit our Trees of Texas website. Print the Tree Cookie Parts mini-poster for your investigation of tree parts using tree cookies. 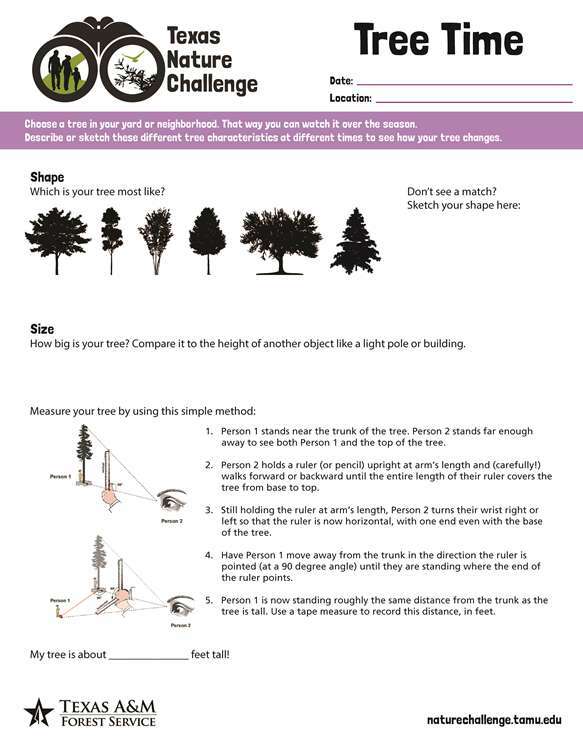 As part of our Texas Nature Challenge, these tree activity sheets will help you experience and learn more about trees. Working forests demonstrate a continuous cycle that provides public benefits. Download the wheel, cut out and put it together to explore the benefits of our Texas forests. Get started on learning to use a dichotomous key with this practice activity that includes six tree species. After practice with the key, identify several trees at your school or in your community and then create your own dichotomous key for those trees. The Texas Nature Resource/Environmental Literacy Plan serves as a framework to coordinate efforts of formal and informal educators to provide lifelong opportunities for all Texans to become stewards of our natural resources. Texas A&M Forest Service endorses this plan and supports environmental literacy within the six components of the plan. The plan is coordinated through the Texas Association for Environmental Education. Find the entire plan on their website.